Place a bench to the side of a cable pulley. Set the pulley to seated shoulder height. Straddle the bench, with your feet flat on the floor. Twist your torso and grasp the stirrup with both hands. Straighten your torso and arms. Your arms should be parallel with the floor and the cable should be pulled taut. Keeping your torso and arms straight, exhale as you slowly rotate your torso to the opposite side. Inhale as you reverse the motion and return to the starting position. Repeat the exercise with your opposite side. Use the seated cable twist to strengthen and stabilize your core, and to strengthen the twisting movement pattern of your torso. The point of sitting down for this exercise is to isolate the rotation of your torso. Keep your torso and arms straight and the movement under control. Keep your arms still; all of the movement should be in your torso. Make sure to get a full range of motion, twisting from one side all the way to the other side, and then back again. Ensure the cable is taut throughout the movement. You can achieve this by adjusting the position of the bench. Squeeze the bench with your legs for stability. Instead of sitting on a bench, you can sit on a stability ball, which will make the exercise more difficult and enforce the recruitment of more stabilizer muscles. However, you will not be able to lift as much weight. While performing the seated cable twist, it’s a good idea to stop halfway through some reps, hold, and try to resist the rotational force for 5 to 10 seconds, before continuing. This will isometrically strengthen your core and improve core stability. 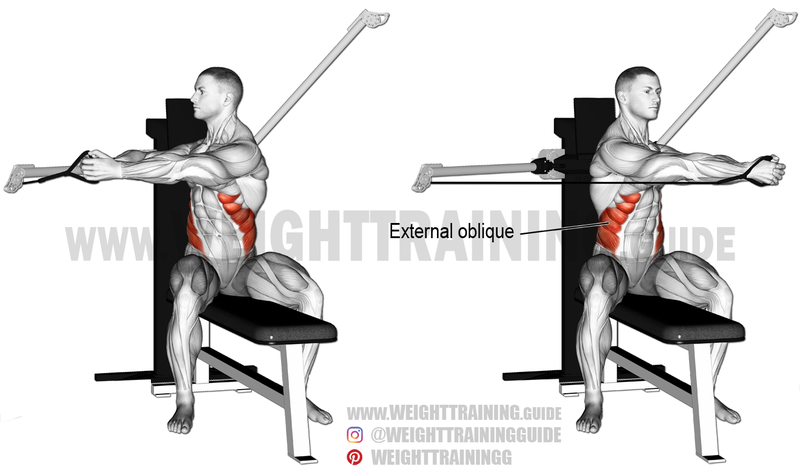 The seated cable twist is also known as the seated oblique twist. See also the cable twist and the cable wood chop. Here’s a demonstration of the seated cable twist as performed on a stability ball. Thanks for some great content. Always looking for new exercises to do at the gym and your Instagram and website are helpibng me a lot so thank you for that.